Of fair Dambea rolls his infant stream. 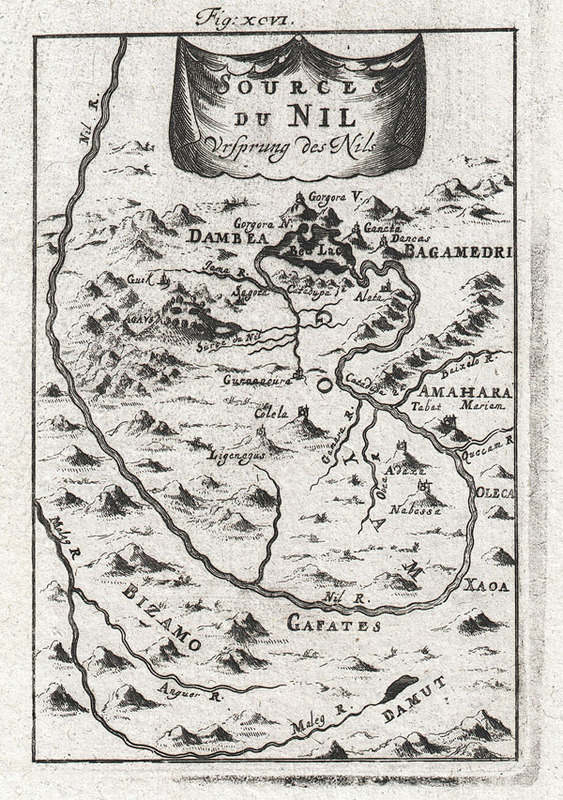 A stunning and surprisingly accurate 1719 Map of the Source of the Nile by Alain Manesson Mallet. Details what is today the Gojjam (Goyam on map) district of Ethiopia around Lake Tana ( here Bed Lac or Dambea). Accurately describes the course of the Blue Nile as it flows southward from the southeastern corner of Lake Tana before hooking around to the west and flowing northwards toward its convergence with the White Nile and, ultimately, the Mediterranean. Names numerous villages and Ethiopian Orthodox monasteries throughout. Shows mountains in profile, however, as this is not a particularly mountainous region, we can assume that Mallet must have added these merely as decorative place holders. Mallet no doubt drew this map based on the accounts of early missionaries who were active in the area throughout the late 17th century. Prepared as figure XCVI for the 1719 edition of A. Mallet's seminal Description de l' Univers which was, itself, the largest and most comprehensive work of its kind issued to date. Alain Manesson Mallet (1630-1706) was a French cartographer, grammarian, engineer and mathematician, active in the mid to late 17th century. Despite being born in France, as a young man Mallet joined the Portuguese - yes Portuguese - army where he served as a Sergeant-Major. Later he was able to levy his war experience into a career as Inspector of Fortifications for Louis XIV of France. It was in this position, where his work entailed examining and sketching various fortresses, that Mallet developed his cartographic interests. His most important work is his monumental five volume opus Description de L'Univers, published in 1683. This impressive work described the cultures, governments, lands, and customs of all the known peoples of the earth and included numerous maps and engravings. At the time, the Description was the largest and most comprehensive work of its kind ever published. A year later, in 1684, he published his 3 volume Les Travaux de Mars ou l'Art de la Guerre. Mallet is also known for his invention of the "dumpy bubble", a telescopic sight incorporating a level bubble used for surveying and astronomical observations. Mallet, A. M., Description de l' Univers, 1719 German edition. Very good condition. Original pressmark visible. Blank on verso. Thomson, J., The Seasons , (London: Henry Woodfall for A. Millar, 1744).